Receiving a ” Thank You” note from a happy client is one of the most rewarding experience in business. The many clients’ testimonials that have been written over the years have always brought to my staff and me personally a great feeling of accomplishment and happiness for a job well done. 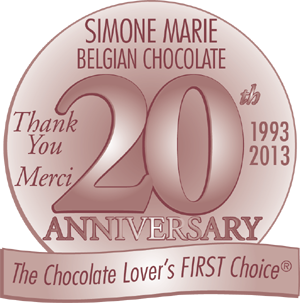 Our personal and business clients alike comment not only about the high quality of our gourmet Belgian chocolates and the elegance of our gift wrapping but also about the excellence of our delivery service as well as our dedication to quality and customer service. It is my great pleasure to share with all the visitors to our site, some of the most memorable testimonials we have received over the years. Thank you for sending this receipt, and particularly for getting your chocolates to my sister and her husband, they phoned straight away, and sounded so pleased. I am really grateful for all your help with the order. We hope you have had a good Christmas, and good wishes for 2015. Dear Simone Marie, Thank you for your kind generosity! I appreciate your careful attention to my orders and your diligence in solving the problem with shipping charges. I will definitely recommend your service to my friends and family. Happy Holidays! Thank you so much for the chocolates! They were a gift for my boss, and he loved them!!! They arrived on time, and looked fantastic. Unfortunately, since I don’t work in the same office, I wasn’t able to try them. I have to take his word for it that they were wonderful. I’ll have to order a box for myself one of these days!!! 🙂 Thanks again! My mother loved the chocolates you delivered …I really appreciate your special delivery and I will have my family in Toronto refer your business to all their friends. Thanks!!!!!!! again, Simone. Everybody loved the chocolates and there were many people who asked “where did you get these” and, I was very pleased to tell them. The wedding went without a hitch and the place settings looked beautiful with the pretty chocolates at everyone’s place. The (logoed) chocolates are AMAZING!!! Both John and Susan were very impressed!! The chocolates arrived perfectly and I even got to try one. Your chocolate is the best!!!! I just want to let you know that the staff at Sunrise of Richmond Hill were absolutely delighted with your beautifully wrapped tower of chocolates and treats! I did not see it myself, but everyone there told me it was exceptional!! It was also described as the BEST chocolate ever! I thought you would like to know how much your efforts were appreciated. Thank you again, Sincerely, June Elliot A Great Success! I just spoke with Marcelle. Her sisters all agree that I’m the best! They were all impressed with the care of the packaging, the beauty of the wrapping and the exquisite shapes and tastes of the Belgian chocolate truffles. Thanks again for helping me deliver a very special gift to my sisters-in-law. I’m sorry it’s taken me so long to write this email to you. I just wanted to say thank you for really making my mom’s last day at work so special! She told me that she was called by the receptionist to pick something up in the lobby and when she got there a lovey woman was there with a beautifully wrapped package and she said it was “from your daughter in France”! My mom was blown away and she thought the wrapping was so beautifully done that she didn’t open it for a few days – she wanted to admire it for a while!! Also I wanted to thank you for really making the effort to be in touch with me before we confirmed the order; I appreciated that you called me on my portable here in France a few times trying to speak with me. I’m glad I found you online and I’ll certainly remember you the next time we have a special occasion. Je vous souhaite une bonne journee et je vous remercie encore mille et un fois! Amy Lorriman There are times when you know that the gift that you present to someone is the perfect choice. Our friend who received these chocolates for her 60th birthday, burst into tears, and declared that this gift of chocolates with her artwork and signature on the wrapper was the most thoughtful and most beautiful gift she has ever received. She could not believe that someone could make something of hers look so enticing. My friend and I would like to thank you for the service that you provided, the care that you displayed and of course thank you for such a wonderful product. I can say that many people were at this party and had exclaimed this was the most unique and beautiful gift they had ever seen. It is our hope that it results in even more business for you, you deserve it. Thank you very much for having the chocolate delivered this morning. We did receive all 6 boxes at 8:24, and they look beautiful! Thank you again, we are very pleased with the final product. Best wishes for the rest of the Holiday Season! I’m very pleased to get to know you. It was wonderfully done and if we are ever again in Canada, I will let you know. Thank you again for the wonderful box of chocolate and the great packaging for the gift basket for our event. The event was a huge success and the winner of the basket was very thrilled. I will send you some pictures of our event once they are available. Thank you so much Simone … you’ve done a fab job!! Just let me say that my experience of making a purchase over the phone and communicating with you over the internet has been extremely efficient and pleasurable compared with past experiences with other companies. Peter I just wanted to thank you for everything. The chocolates look amazing. I am getting many compliments, and already I have some of my clients and family thinking of doing something similar. I’ll pass along your contact information whenever I can.